It’s also confirmed that Don himself is heavily involved on production of this set, which means he’s being compensated, and that this will be the definitive publication of his work in his own language. Good as it gets, folks! So Awesome that Don is involved it this! To tell the truth though, I would expect nothing less from Fantagraphics, they truly are one of the rare class acts in the industry. When Don Rosa makes an appearance at a convention he always has an assortment of prints with him. A large number of these prints are famous comic book covers with the original characters replaced with characters from the Duck Universe. I always loved that idea and one boring winter day I thought it would be fun to take a shot at making one myself. The cover I chose was Fantastic Four #49 drawn by the King himself, Jack Kirby. The issue, “If This Be Doomsday!”, was the continuation of the first appearance of the villain Galactus in the the Marvel Universe. It is a classic comic in every sense of the word, and one of my favorite comic covers of all time. In my version I chose to reverse the roles. Galactus and Silver Surfer would be Scrooge and Donald while the Fantastic Four would be filled by various members of the Beagle Boys Gang. I really liked how the drawing turned out. If I could change something about it, I would change the Beagle Boys. They come off as being flat to me, and I would have liked them to be more dynamic, to actually convey a sense of movement and pop off the page. When I was done with the drawing, I scanned the image in and did some basic flat coloring. I never went back and did any shading on it though. I have a small collection of original sketches by Don Rosa. This is my newest, a quick drawing of Donald Duck. I love Donald Duck. I have never been a very big Mickey Mouse fan, in fact I would almost say I hate Mickey Mouse, but I love Donald Duck. Donald Duck was the everyman. A little hot-headed, always having things go wrong… struggling to make it through the day. That is why I loved Donald Duck. Even when I was younger I found it much easier to like a character with real personality and faults. 75 years ago today a Disney short was released by the name of The Wise Little Hen. This short marked the first appearance of Donald Duck. Donald would have a long career at Disney, and would at times surpass Disney’s Mickey Mouse in popularity. Donald, according to the Disney Comics Worldwide site, has appeared in over 150 cartoons. That is a pretty impressive number in my opinion. These days Donald and his family live on in comics. 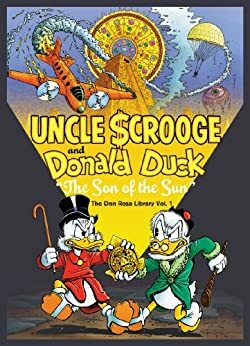 Living off of a rich and well built family and history created for him by the great Duck artist Carl Barks in the town of Duckburg and kept going by the equally as great Don Rosa and others. In the United States Donald is not as popular as he once was, but in Eurpoe he continues to thrive. Each year Tons of new comics are released and the Duck’s adventures continue. While here his fate is up in the air for the time being. With financial problems sending Gemstone publishing the way of the DODO the future of Disney comics is up in the air… With a little luck another company with enough love and respect for the characters will pick up the liscence and do right by them. Yet another Donald Duck in my collection. This one was given to me by my wife for our anniversary last year. As you can see it shows the modern Donald painting a picture of his early self. This piece was bought from the Disney Online store and has since sold out. This is probably my favorite item of all my items on my desk. That much is pretty obvious I think. Last year for my birthday my wonderful wife gave me a couple ducks. This is one of them. Donald Duck carved as a tiki statue. Donald was originally intended to be a garden statue, but I think he looks much more at home on my desk. Since I received him I have thought about getting some wood and carving some other ducks to keep him company… maybe a Daffy and a Howard… Even a Scrooge McDuck if I get energetic. So far I have not gotten around to it though.